Space per pupil: 133 sq.ft. According to a 2009 demographics study, Austin Public Schools will have 300 to 400 more students by 2014 and almost 1,000 more students by 2020. With the student population increasing at a higher rate than originally projected, the school district knew it was time to take action. Working with a community-based task force, ATS&R assisted the District with long-range planning. In 2011, a referendum was passed for the construction of a new intermediate grades 5-6 building and an expansion of the Woodson Kindergarten Center. I.J. Holton Intermediate School’s design heightens the new STEAM program at Austin Public Schools and embraces the objective to “See Learning” everywhere in the building. The result encourages learner engagement and creates multiple flexibilities; every space is a teaching tool! 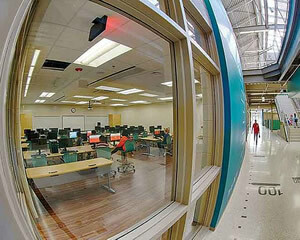 Classroom learning is on display through glass walls, offering students/staff to view dynamic activities from the “Main Street.” Across from math class, you might see a dance or theatric rehearsal. A short walk further, you’ll encounter art studios and technology education labs, where students create and invent. Learning and creating are celebrated and visible for all to see. Amidst the music, movement, and artwork, students creatively problem-solve and collaborate. The spaces support the activity of “critique,” which is paramount in listening and exchanging of ideas. 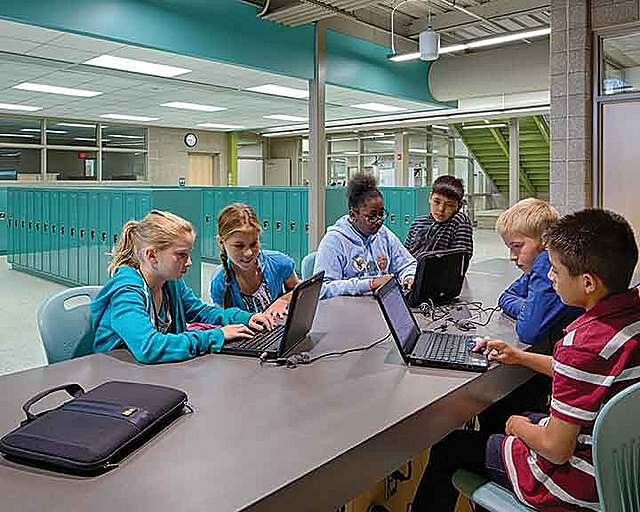 Six learning communities with classrooms, labs, studios, and teaming areas facilitate flexibility via various room configurations, class sizes, teaming capabilities, technology integration, and collaboration. 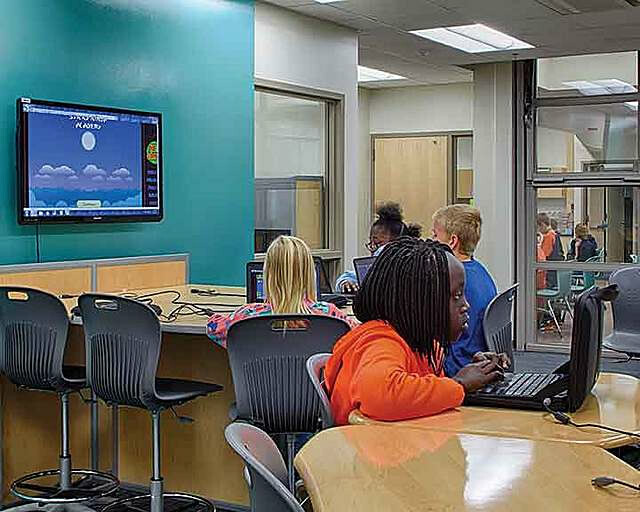 Virtual Learning Resource Centers (collaborative stations with technology access) flourish with computer/video capabilities in breakout spaces, stimulating student research and development. Students love the variety of flexible soft furniture and high-top tables and chairs to enhance their learning and exploration experience. 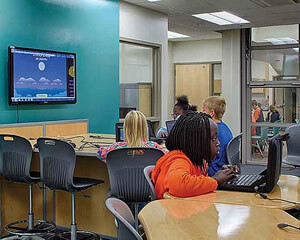 The “anytime, anyplace” technology theme decentralized the media center, locating much of the space to where students and teachers connect to conduct learning, research, and experiments. 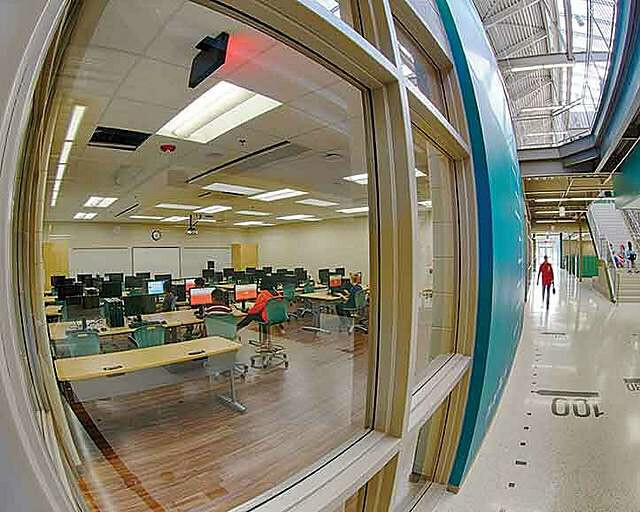 Integrated into the learning communities and adjacent to multi-purpose science labs, breakout areas support research and development for a “think tank” type of learning environment. Students engage in research and switch to a “hands-on” project-based environment without interruption. 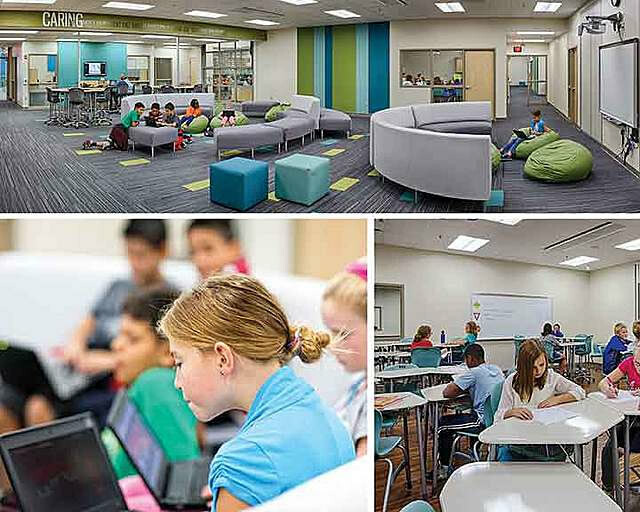 This informal setting features flexible furniture that supports deliberation, debate, and presentation to enhance the STEAM curriculum. 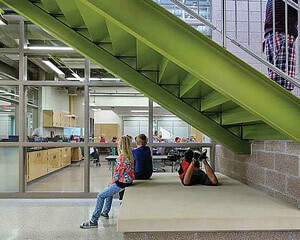 Multi-purpose science labs between each learning community feature vertical bi-fold glass panels for easy connection to breakout space. Technology-enriched pivot walls open to adjacent rooms for increased program flexibility, encouraging open/connected learning environments. Operable partitions and pivot walls with Smartboards allow the configuration of various-sized spaces to support the STEAM curriculum. Two art studios and two technology education labs showcase student work in display nodes. Large-scale experiments take place in the exterior “tech court”, next to the tech ed labs and media center. Three music spaces for band, orchestra, choir, and general music further emphasize the arts program. The labs and studios feature perimeter casework, which allows the center space to be configured for experiments and presentations, or table/seating areas for teaming and demonstrations. Windows replace solid partitions, encouraging students and staff to view activities in the learning communities. Activities within the learning spaces become “displays” for engaging students. “Feet” and “meter” markings and graphics inlaid into terrazzo flooring and applied as wall murals transform the hallways into a teaching tool, giving students a sense of measurement, conversions, and scale of spaces. Students compare their height with their favorite dinosaur and use this tool in real-life experiments involving kinetics, distances, and projectiles. Level 1 - The principal’s office, receptionist, and other offices have direct visibility to the site entrance, parking areas, and building entrance for observation. The entrance vestibule design directs the visitor directly into the administration suite, as the vestibule doors are locked. Under-counter panic buttons are installed at various locations in the suite. The building has lock-down features, controlled from the administration area, that protect the occupants inside the building and also prevent people from entering the building. Level 2 - Beyond the administrative area, doors into the classroom clusters lock down to stop intruders. Activated drop-down grilles in the Main Street slow down intruder access to other building spaces like the cafeteria, gyms, locker rooms, and specialized classrooms. Level 3 - All classroom doors have interior locking mechanisms to protect occupants in the classrooms. The site incorporates exterior signage, designated vehicular entrances, and purposeful circulation to minimize loitering and unwanted vehicular activity. The design incorporates numerous environmental/sustainable design features that enhance student and staff comfort, reduce operational costs, and respect the environment. An ice storage system provides 100% cooling to the building during day, eliminating the operation of chillers during peak demand. Variable frequency drives, occupancy sensors, modular boilers, and other efficiency features are provided. Strategically located mechanical rooms reduce duct lengths in the building. The chilled beam mechanical system provides occupant comfort and reduces duct sizes, thus lowering the building volume and overall cost. The exterior wall design provides increased wall insulation. Daylighting studies were conducted for site orientation and tinting of exterior glazing. Brick-cavity construction with several metal paneled areas forms the exterior walls. Built-up multi-ply roofing offers longevity. High performance glazing with varying tints determined by site orientation assists in reducing energy costs. Translucent glazing systems provide diffused natural light in the gyms. The building placement is respectful of the neighbors with berms screening their view. Learning spaces are designed near the wetland area, with trails and clearings for group collaboration. Located next to the middle school, the bus loading area strategically serves both buildings. Playfields were also located for shared use and community access. 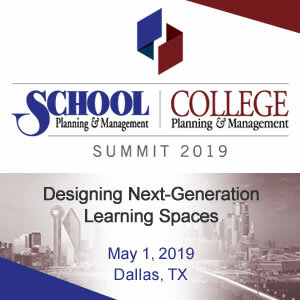 Austin Public Schools recognizes the need to prepare students for a rapidly changing world and to provide facilities that engage every learner. 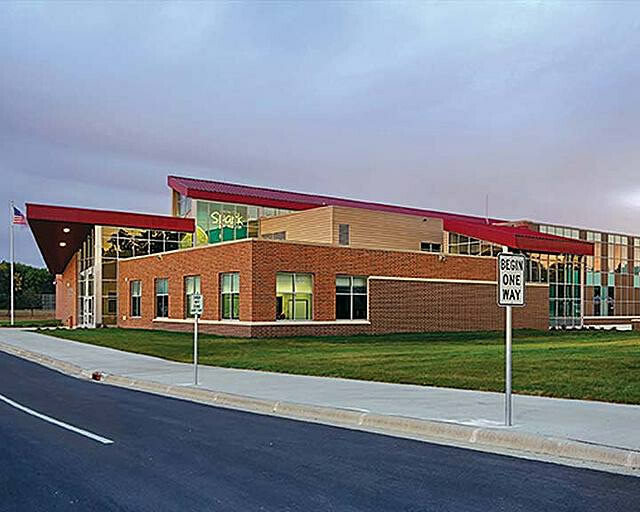 For this unique project, staff and administration engaged a study team from the University of Minnesota to collaborate with the District to re-adapt its curriculum to focus on preparing students in the concepts of science, technology, engineering, arts and math—referred to as STEAM. Research shows students will have a deeper understanding of course material if concepts are addressed in a variety of curriculum content areas. When the STEAM program is fully implemented, the school will offer highly refined interdisciplinary projects and other standards-based learning activities that integrate inquiry, creative expression and problem solving, the use of technology and engineering processes, and an understanding of relevant societal realities, all evaluated by the University of Minnesota study team. Allowing students to engage in learning activities in all areas of the school. We see the current operations bringing about change for well-balanced, well-informed, and well-prepared students for success upon graduation. Austin Public Schools is currently working with a study team from the University of Minnesota on applied research and evaluation of the new school through a three-phase approach. Phase 1 focuses on teacher growth and change, exploring the areas of engineering and how physical space affects teaching/learning. Phase 2 includes ongoing long-term evaluations of the STEAM curriculum. Phase 3 reviews implementation and teaching around habits of the mind such as communication and perseverance. In sessions with University professors, teachers read, processed, and practiced information from the book, Comprehension and Collaboration. Using site-based professional learning communities, teachers investigated research on comprehension, collaboration, inquiry, and project-based learning. The final training utilized the Engineering is Elementary (EiE) curriculum from the Boston Museum of Science. Engineering, as a process, will be the framework for the STEAM process at I.J. Holton. Each University of Minnesota session engaged teachers with hands-on experience with new engineering units. This project continues to be considered one of the most out-reaching school designs that supports and enhances 21stcentury education themes of collaboration, creativity, competition, communication, and choice.